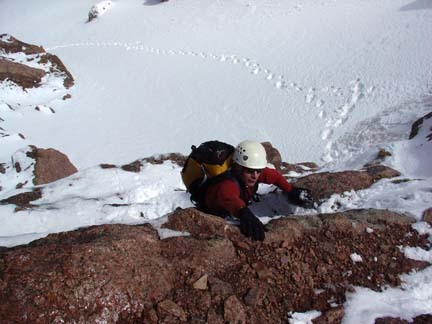 Bill and I had been planning an ascent of Pikes Peak's north-facing and compelling "Y" Couloir for many weeks prior. 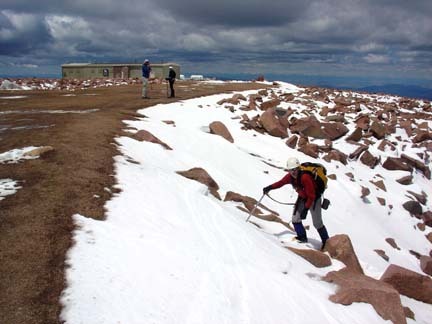 Bill is whittling his 14ers list and if successful on Pikes Peak, he'd have three remaining. 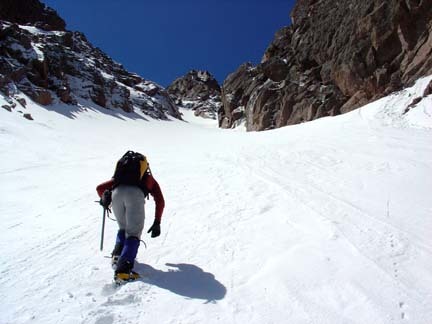 He wanted to climb Pikes in spring to facilitate a snow climb to make the ascent interesting. It's hard to get interested in a peak that has a road and a cog railway to the summit! Allison joined us for much of the hike but continued up the Northwest slopes route to the summit instead of climbing the couloir with us. We hiked from the Crags Campground on Pikes' west side to 13,110' and descended Rumdoodle Ridge to the Bottomless Pit at 11,640' where we began our climb to the sky! 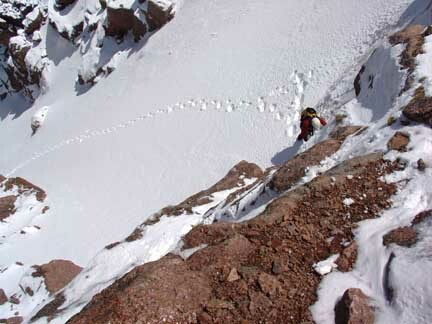 We ascended the "Y" Couloir and climbed the left branch at 13,400' to the summit. We awoke at 5:15am at our informal campsite about a mile down the road from the official Crags Campground on the west side of Pikes Peak. It's much cheaper (free) to camp in one of the plentiful informal campsite in the national forest. We had camped right next to the stream and we had all slept very well given the sound of the running water. I love camping next to small streams. By 5:50am we had everything packed up and drove up to the parking area for the Devil's Playground/Pikes Peak at the Crags CG at 10,100'. We hit the trail at 6:10am. No other cars were at the trailhead. The hiking for the first hour was cruising on dry ground and we made very good time with Allison in the lead, reaching the 11,900' elevation on the trail in an hour. At 11,900' though, about four inches of new snow made the going a little slower as it was just enough snow to be slippery on the rocky trail. We arrived at the Devil's Playground at 12,950' just before 8:00am. The mountain staff were plowing the road so there were no tourist cars cruising by as we looked both ways and crossed the street. Hiking along the east side of the road, we followed the intermittent trail to 13,100' at the top of Rumdoodle Ridge. At this point we said goodbye (temporarily) to Allison so she should could continue up the trail along the road to the summit while Bill and I descended 1,500' feet down Rumdoodle Ridge to the improbable bottom of the Bottomless Pit at 11,640'. Descending the ridge didn't appear to be difficult from above but as we descended we realized it would take longer than anticipated given the new snow and difficultly of seeing the best route from above. Bill descending the upper portion of Rumdoodle Ridge. 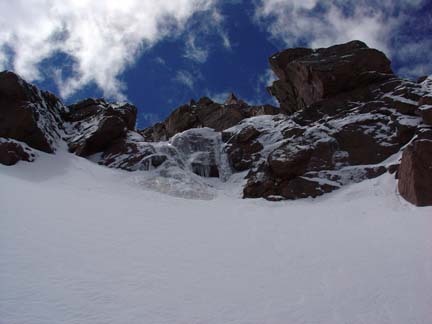 During our descent of the solid rock of upper Rumdoodle Ridge and the super loose rock of lower Rumdoodle Ridge we had some good views of Pikes Peak's north face including the Y Couloir. 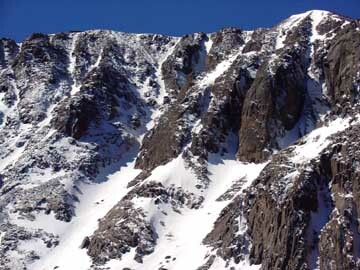 Pikes Peak's north face from Rumdoodle Ridge. The red dots marks our ascent line of the left fork of the Y Couloir while the yellow dots show the right fork. An hour after parting with Allison, we arrived in the Bottomless pit. Bill and I both commented how beautiful this area is. Sparce but tall trees sprouting in various locations surrounded by rocky ridges with a small stream flowing through. It was beautiful. Yet, if we looked hard we could see the glimmer of a car's front bumper high above us on the ridge. From the Bottomless Pit we continued up towards the base of the Y Couloir on snow-covered talus to around 12,400' where we donned our crampons and ice axes. The 4 inches of new snow on top of the old snow made for easy step-kicking but also meant the snow would be balling up underneath our crampons. A few swift smacks on the boot with the ax every now and then solved that problem. We carried on up enjoying the bluebird morning, still air and soft snow to around 13,400' where we had to make a choice about which fork to take. From descriptions we'd read the left fork is the more direct route to the summit and offers steeper, more challenging climbing with the chance of some rock scrambling near the top. That sounded like the ticket to us so we turned left. From the split we could see a major water ice-covered rock band at 13,500' that blocked easy passage up the couloir. We could see a potential way around to the left but going straight up the ice or slightly right looked interesting too. We headed straight for the cliff. At the base we decided to skip the water ice on account of not having second tools and ascended steep but good ledges on the cliff's right side. Looking down at Bill from the top of the rock band at 13,500' You can see the switching-backing ledges we ascended in the lower portion of the photo. The ledges were covered with new snow and involved one high step but the hands were good. Bill powers through the rock band! Once above the rock band we enjoyed another 300 to 400 feet of good snow climbing. More enjoyable snow climbing above the rock band. The clouds were starting to roll in a bit by this time but the climbing was so much fun we didn't want it to end. But, as the cliche goes, all good things must come to an end and we were soon climbing on scree that was covered by the four inches of new snow. This made for unpredictable footing but wasn't too bad. I could begin to here the sound of motorcycle engines just above me and knew we were close to the summit. The finish on this fork of the Y Couloir is very enjoyable as we just popped out right at the parking area not far from the summit house. As we topped out we surprised a couple of hikers that just happened to be passing by at that time. Bill tops out of the couloir at the summit to the surprise of the hikers in the background. On our ascent Bill and I were discussing the summit house/concession stand/gift shop situation and whether or not we'd buy anything. 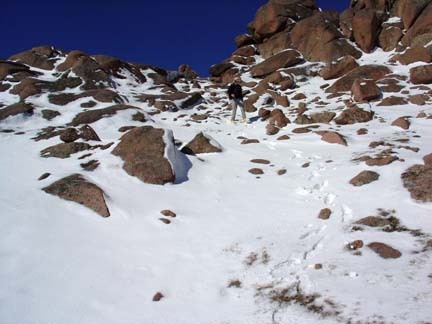 On one of my two previous climbs of Pikes Peak I was very diligent about not entering the building or making use of any of the facilities on the summit as it just didn't seem right ethically. However, this time I thought, "How often can you climb such an awesome snow route and top it off with a plate of pipin' hot nachos at the summit?!" At the summit, Bill and I answered the questions of a few curious tourists and found Allison sitting inside reading her book. She had arrived at the summit two hours ahead of us. We all three enjoyed a plate of nachos and descended the trail along the road back to our car by 3:30pm for a total of 9.5 hours round trip including 45 minutes on the summit. 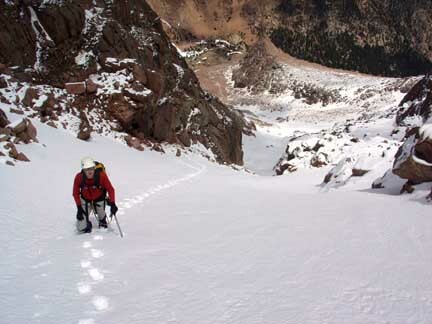 The Y Couloir is a very fun and exciting route on a mountain that is generally considered a walk-up. Highly recommended! Written by Jason Halladay on 12 June 2005.